As someone who is always on the lookout for gluten free rucksack snacks for walking, these Nairn’s Oat Bars caught my eye. New in store, they are gluten free, not too high in sugar and come in three flavours: Cacao and Orange; Mixed Seeds and Protein; and Apple and Cinnamon. They are also natural, vegan and high in fibre. We dropped them into a pack for a day’s walk and did a taste test. They are so tasty, I was glad to have a resident guard dog to protect my supplies. 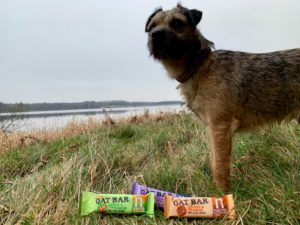 The verdict on Nairn’s Oat Bars was that the Apple & Cinnamon was the most treat-like, tasting like a delicious apple crumble with the cinnamon not too overpowering. Second was the Mixed Seeds & Protein – I liked the consistency and crunch of this one and it felt healthy without being goody two shoes. Third in our taste test was the Cacao & Orange, which is not a favourite flavour for me and it just didn’t taste as natural as the others (though it is!). And thank you Nairns, for another great gluten free product! These were 79p in my local shop, though you can buy them in multi-packs in the supermarkets. They will be my new go to snack for hillwalking from now on as the low sugar level (5-6g each – still high but low for a ‘health’ bar, in my experience), the fibre and the flavours do it for me!